Jase just got back from a week in Boise. I definately think that he was missed. 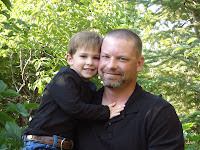 Austin was very excited to be able to help his dad wax the pickup. Even though it was kind of cold outside, he needed a rag to help. I am so glad that he has the opportunity to learn from his dad. I did my civil duty this morning and voted. It is an exciting election this year. 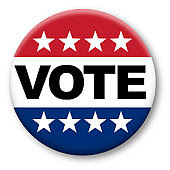 No matter how you vote, history will be made. I have to say that I will definately be glad when this election is over, but I am excited to watch tv tonight to see how it all turns out. Jase had to be out of town today so we had to do an absentee ballot for him. He voted a few days ago. I decided that next time, that is what I am going to do to. I had to take the boys with me today, and they were really good. They got stickers, balloons and cookies. They asked me on the way out if they could come back again. This is a special election for my mom this year too. It is the first time in her life that she will get to cast her ballot for the President of the United States of America. She just got her citizenship. I am so proud of her and very excited for her to have this opportunity. Trunk or treat 2008. Our new ward did the trunk or treat on Tuesday, so that everyone could still go trick or treating on Friday. 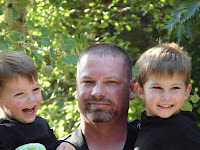 It started at 6pm and this is Carter, Austin & Jase waiting for all the excitment. Notice the short sleeves and lack of winter clothing. It was a beautiful night. I can't ever remember trick or treating without coats, even when I was a kid. After the trunk or treat, they had drinks and games inside the church. It was a lot of fun. 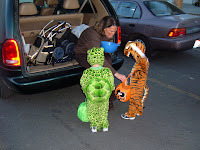 The boys doing a little trunk or treating. 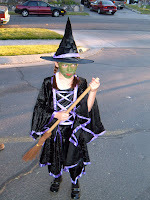 Macy "The Little Witch" She was so excited to have her face painted. 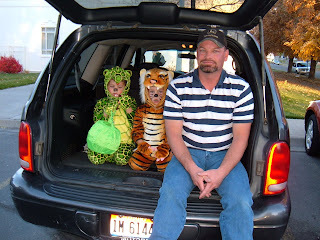 Friday night we took the kids to a neighborhood and let them go door to door trick or treating. Macy was a little confused about what we were doing, and I had so much fun explaining to her that she was going to be trick or treating like I did as a kid. The first few houses they were pretty shy and unsure of what they were doing, but they caught on quick and it was fun to see their excitment as they caught the Halloween spirit. Jase and I walked with them, and it was such a nice night. Warm, no one even wore a jacket (Shocker!!!) What a fun Halloween we had this year. We carved pumpkins today. 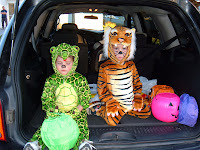 The trunk n' treat is on Tuesday night, and I thought that it would be fun to take the pumpkins with us. The kids had so much fun doing this. 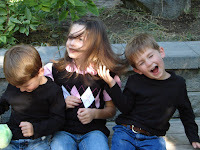 Macy and Carter were good sports, but Austin was not about to put his hand in the pumpkin. I looked over at him halfway through and had to laugh. He was standing on the chair, with a disturbed look on his face and his nose plugged. He couldn't stand the smell of the pumpkin as much as he couldn't stand the feel of it. He had to go to the other room. I laughed. My big tough boy was taken out by a pumpkin. Saturday the D.A.R.E program had kids come to "Dr. Slaughter's House of Terror". They had nice monsters and handed out treats on the way through the spooke alley. The kids had fun, but their favorite part was the train that took everyone back to the parking lot. It was fun for them to get dressed up in their costumes. I could hardly believe that we had that much snow. It was so cold too, not another surprising fact for Idaho. I always get excited at the first snow. It was so beautiful how it blanked all the ground with a beautiful coat of white. I figured that by the time we got out of church that it would all be gone. That is usually how it works around here, and the kids were anxious to play in the new snow. I was suprised to see the snow still on the ground when we came out of church. The kids changed into snow coats as soon as they got home and ran outside to build a snowman. And much to my suprise it snowed some more this afternoon. They claim it is going to warm up at the end of the week, so maybe we will have a little more fall before we have to endure winter again. Well we have moved. It was quite an experience. It was hard for us to leave our old home. It has been home for so long and we were all so comfortable there. It was the only home that they boy's had ever known. But change is inevitable and we embraced it as best we could. Jase started a new job the end of August. It has been so much better and we have enjoyed having our had with us. It has been challenging for him and very different from anything that he has ever done, but he is doing well with it. We decided that we would relocate and then we didn't have to do a bunch of commuting. The move was a lot of work. Man I can't believe how much stuff we had collected. We did a lot of cleaning out and simplifying which I actually enjoyed. We had a lot of great help moving and appreciated everyone that was willing to spend their daying moving our stuff. 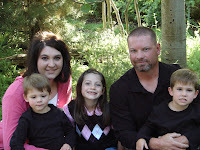 We would not have been able to do it without great family. 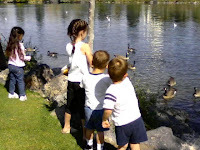 The first week that we were here Aunt Andrea came and took the kids to the river to feed the ducks. 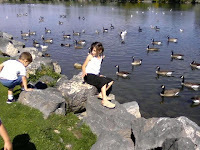 They had such a good time and it was so sweet of her to spend the afternoon with them. How blessed we are to have family all around us. I can't believe that my baby is 7 years old. She has grown up so much. She has been looking forward to her birthday for months now. In fact she asked me this afternoon when her next birthday was. I told her in 365 sleeps, and she looked at me like I was making that up. Not exactly sure who invited the grandparents that would bring a piano. Grandma Rumsey, has noticed Macy's love for music. She always wants to play on Grandma's piano. She specifically asked that there was a 7 on the cake. She got her 7. Every year we make a few trips to Island Park to help Jase's Aunt & Uncle get firewood. We always have so much fun being up in the woods and enjoying nature. The boys especially enjoy the lunch box. They are just making sure it is protected. Macy, being such a big help. She loves knowing that she is helping. 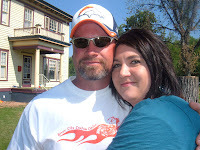 Jase and Margie, taking a break. There is a blog, www.vanillajoy.com that is doing these awesome give aways this week. They are giving away the coolest scrapbook stuff. You have to check it out and enter. All you have to do is post a comment. Simple as that. Best of luck, I will be checking it out everyday. 1st grade here we come!!!! Oh, I can't believe that my baby is in first grade. I got all choked up just taking this picture and remembering last year when we took the same picture just before kindergarten and I realized how much she has grown. I am having a harder time with 1st grade compared to kindergarten. She is going to be at school all day. It seems that she has grown up just way too fast. 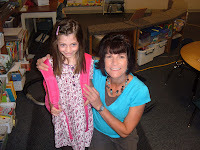 Macy and her teacher. She is so nervous about the first day of school. She is so shy, but her teacher seems like she will be really fun. Waiting in line to go to class. Mom was having a hard time leaving. I probably would have stayed all day if they would have let me. 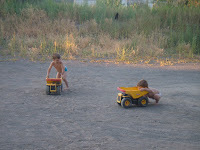 Tonka Truck's and Dirt - A boys HEAVEN! 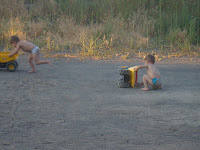 Ahhh, there is nothing better than tonka trucks and dirt for little boys. 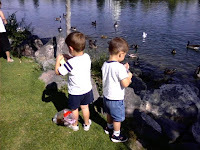 For some reason my boys can seem to find dirt to play in no matter where they go. 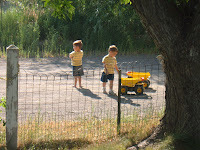 I thought that it was a little too quiet in the house, and upon further investigation I discovered the boys outside in their underware (yes they are frequently in their underware), playing with their trucks. It was so cute to see them playing so well together. I snapped these pictures without them knowing I was watching. 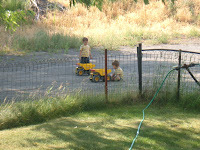 This was also cute, they were outside playing and had their trucks right next to each others. Thanks to Grandma for the great birthday presents, they boys are loving their trucks. OK, so I know that I am a little slow to post, but I have really good intentions of getting better. 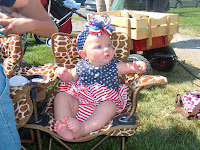 These are the pictures from the Pioneer Day's parade. It is such a fun parade to go to. The kids had so much fun. After the parade we went to Grandma's to swim. Thats the best way to spend the after noon after a parade. Cooling off in the pool. Macy with her bag to put all of her candy in. We were glad we had it, we ended up with so much candy. 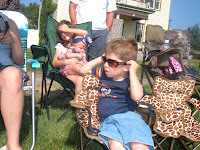 Austin wearing mom's shades. He has such a hard time in the sun and refused to wear his own glasses. Apparently mom's work better. Little Lexxi, she is so stinkin' cute. 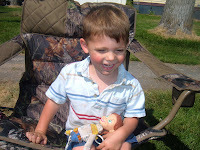 Carter, he thought he was pretty big stuff sitting in dad's chair. My all american boy. Austin loves baseball. His favorite movie is "Everyone's Hero". If you haven't seen it I would strongly recommend it. It's way cute. Austin asks me every night on our way home if I will play baseball with him. We got him this tee with plastic ball and bat for Christmas. But he won't use them. He has to have a hard ball and this little wooden bat that he got from my mom. He takes that bat everywhere with him. He is such a boy. He is so excited. Tonight we are going to a Chuckers baseball game in Idaho Falls. It is going to be so much fun. I am excited to get lots of fun pictures. Do you ever have a day where you feel like your life is in complete chaos. Well I have been having a week of it. I have so many things that I want to get done, and so many ideas for things to do, and it seems like the harder I try to get it all done the less that gets accomplished. I am not even talking about my regular house cleaning chores (which by the way are not getting done). I have lots of projects that I have started and not yet completed. The funniest thing is that the more chaos I feel the more ideas I get. Now if I could just figure out how to keep track of them all. Today Jase made the comment to me that their watering was slowing down and summer was half over. To him this means getting the crops harvested and then slowing down. I was so sad when I thought about summer being half over. It seems like it just started, I am not ready for it to be over already. 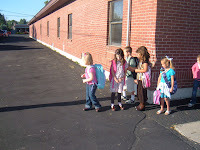 My Macy starts school in a month. Oh how I am not looking forward to the chaos of school mornings. Stressing myself out making sure that we have everything and getting her to the bus in time so that she doesn't miss it. Macy is bored with summer already and looking forward to being in the 1st grade. 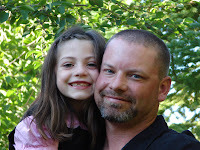 Oh how she is growing up, 6 going on 18. Sometimes I can't believe the drama that we have to deal with. Jase keeps asking me if it is going to get better and I informed him "Absolutely Not!!!! Next we hit puberty and it will be twice as bad" Oh not looking forward to that. 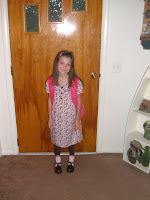 I am hower looking forward to school shopping and buying her lots of new school clothes. She is so like me and hates to shop. That is where the internet has saved my life. I can go on there, pick out exactly what I want and have it sent directly to my door. No more crowds, man life is good. Ok, so enough rambling. I have a long list of things that need to be done, and it's not going to get done on it's own. Best of luck with your chaos. We had a fun day fishing. Even though we did not catch anything, we still had a good time. 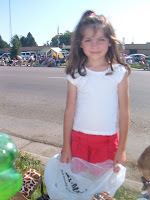 We started our 4th of July with a parade in Rexburg. It was so hot. We were glad that it wasn't too long. The sun was really bright. The only time that mom doesn't yell for being in the road. Catching a little candy and watching the parade up close. AH!!! We needed to cool down a bit. Just making sure we are still friends. Now this is a holdiay!